Past my front yard, out to the north-northwesterly direction, the hills are turning a rusty orange color. 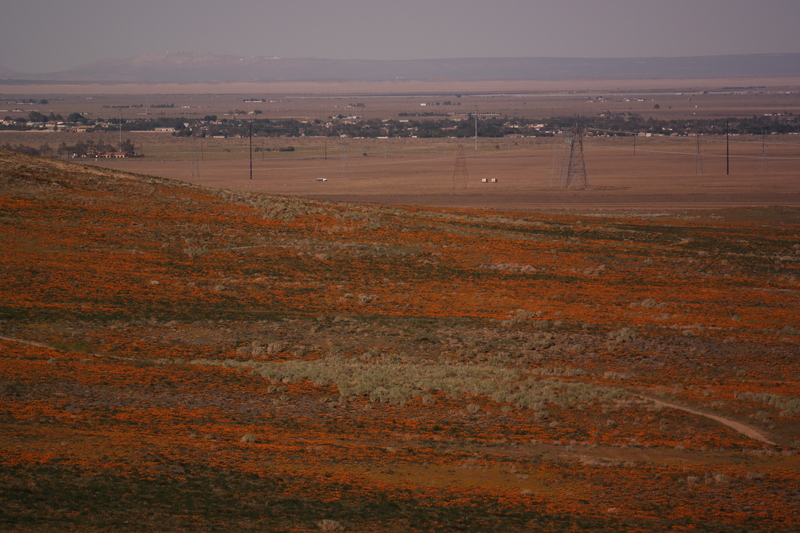 The entire desert has actually turned green, but that orange, only meant one thing: California’s state flower, the poppy, had got its bloom on. I haven’t been out there since 2008, so naturally I needed to start walking. Well, I drove first, and then did a short seven-mile hike through the California Poppy Reserve on the Antelope loop trail (which is in the state natural reserve). I started the path alone and ran into three other people by the time I finished. It was miles of relative solitude, not bad given nearly half a million people live fifteen minutes away. In that time I realized just how loud of a human I am. My footsteps crunched and crackled, sending birds and insect and lizards scurrying a half mile before me. I could hear my heavy panting breath, sadly that was because of how out of hiking shape I am and not because of how strenuous the trail was. Now and then the wicked winds would mute all those thoughts of self, leaving only the rushing roar inside my ears. This is the “High Desert” of California, not to be confused with the other desserts in California. 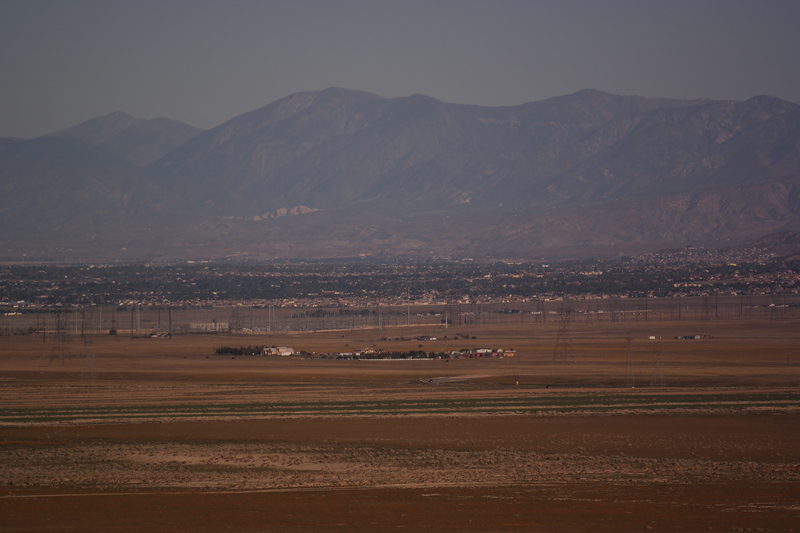 Palmdale and Lancaster, the two big towns near by, house Los Angeles commuters, sitting in the far north western corner of the great Movaje Desert. Out here we experience apocalyptic weather- extremes of sorts: heat (searing), cold (snowing), winds (tornadoesque), dust storms that remind us of the dust bowl, dry (bone cracking), wet (flash flood warnings). Unlike the other “deserts” this one sits a few thousand feet higher in elevation then Palm Springs or Death Valley where its just a different type of miserable throughout the year. We lie in the rain shadow of two mountain ranges- the San Gabriel and the Tehachapi ranges. Half a million people, residents who mostly commute an hour south to Los Angeles. Yet out here its desolate. I started off modestly, wanting to do a 2 mile loop up a hill and back down. 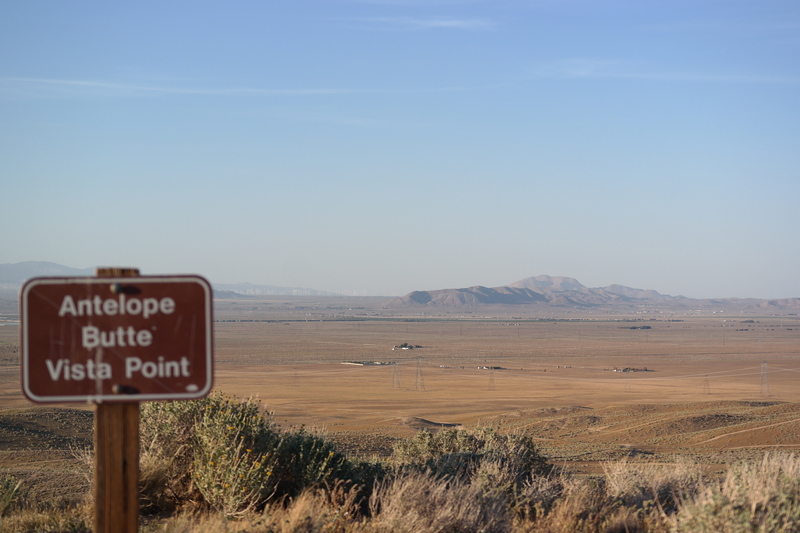 But I kept finding myself attracted to the higher peak just beyond the one I reached, until I ended up doing the full Antelope Trail, which has its vista on top of Antelope Butte, which is 2,795 feet high (which is still less then my houses elevation which is 3,500 feet!). I didn’t know what a butte was, but apparently, is a geologic pimple without the volcanic sexiness. And this particular butte, Antelope Butte, doesn’t stand up as an iconic world-renowned geological feature. But it gave a wonderful view of the far-reaching high desert that sprawls into California’s Kern, Los Angeles and San Bernardino counties. From the Antelope Butte I could make out another locally important feature- Saddleback Butte (which is also a state park) to the far east of the valley and to the north Willowspring Butte (which is pictured above) where the stately white sentinels (aka windmills) reside. 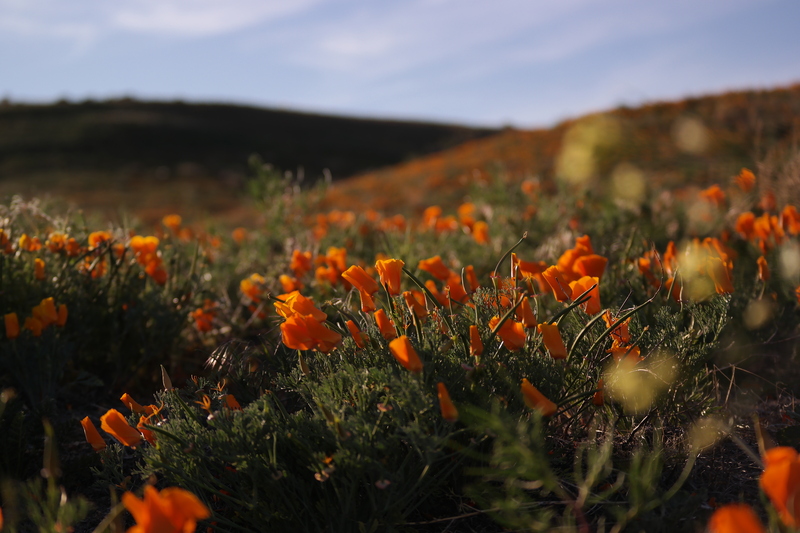 The Poppy Reserve is a great example of how the “High Dessert” climate is changing, more precisely how humans are changing the environment. Arid desert is slowlyis changing into a savannah-like environment, with wildflowers and grasses. Unfortunately, even with seasonally high water fall, it will remain a desert because of the extreme weather patterns and the fact that these plants aren’t drought resistant, nor do they have a impacted season of heavy rains and migratory big animals. If anything, with the current drought coupled with high winds this part of California will turn into a dust bowl (something I experienced several times last year!). But until then I can enjoy this stunning meadow-ish ravine, which I found on my descent from Antelope Butte. 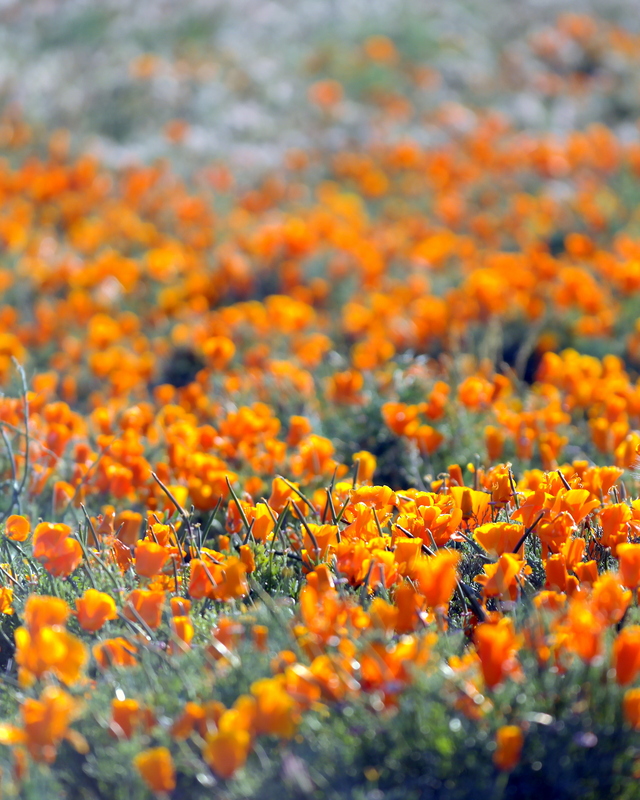 The slopes were carpeted with poppies, along with various shades and types of purple flowers. Natural? Apparently not, poppies aren’t native to this area. The vegetation that existed in this corner of the desert – yucca and the Joshua trees- were all cleared away to make room for grazing large herds of livestock, as well as grow acres and acres of Alfa Alfa when the water was abundant. But when agriculture collapsed due to the expense and lack of access to water, fields were left fallow. The original plant couldn’t come back, in their stead seasonal wildflowers like the California Poppy and various hard grasses took over. 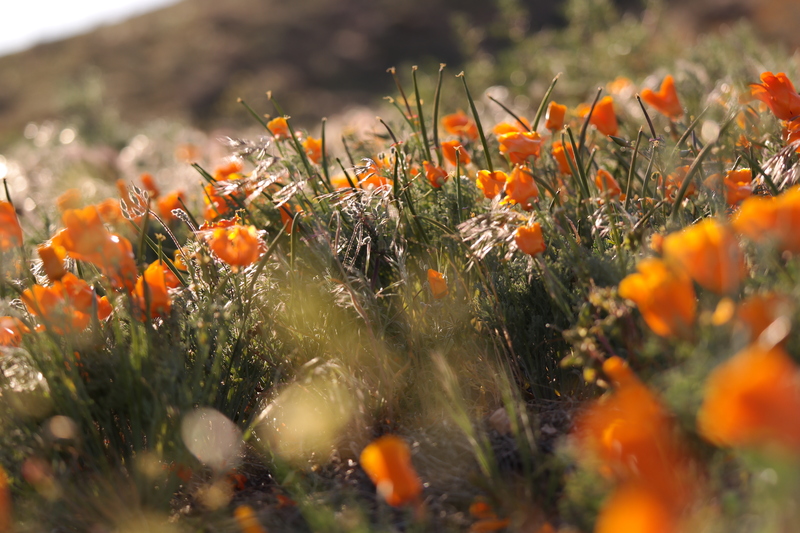 You can find the California poppy all over California- it’s the state flower- but its only here that it is the dominant plant, unburdened by shrubs or rascally tall grasses dwarfing the shadows in their shade. The desert hills dramatically changes color from dusty boring brown to lively electric orange, though all that depends on good winter rains, which we haven’t had now since 2008. While its some dazzling natural beauty, I sort of wonder what the point of coming out here is. Its seasonal, once you see one poppy, its nothing special. Super delicate, they close up, like above pictures, towards sun set; and, you can see a slope carpeted with them miles away. Why go hiking up in this reserve? Things that came to my mind while rambling around on the trail were words like: solitude, contemplation, admiring (creation), purpose. All those things get to the why, but it eludes me as too why I am drawn to places like this.